INDICATIONS emerged at the weekend that the Chief Justice of Nigeria, CJN, Justice Mahmud Mohammed has queried the Chief Judge of Federal High Court, Justice Ibrahim Ndahi Auta, over conflicting judgements his court delivered on the Abia State governorship tussle on Friday. A highly placed judiciary source yesterday told Nigeria Pilot that the CJN is bitter with the CJ of the Federal High Court for not assigning all cases relating to the Abia State governorship tussle to one judge to handle it; rather he chose to assign a different one to another Federal High Court judge in Owerri to handle the matter, thereby creating confusion and embarrassment to the Nigerian judiciary. According to the source, “The CJN had scolded Justice Auta on the PDP crises when he deliberately assigned cases to judges in Port Harcourt and Lagos, creating problem for the party. After apologising to the CJN, he repeated the same thing again. There is a query waiting for him; that is the reason why the former CJN, Justice Aloma Muktar refused to see Justice Auta eye-to-eye throughout her stay as CJN because of this type of behavior, “ the source said There seems to be no end in sight to the ongoing controversies surrounding the Abia State gubernatorial seat as three courts of competent jurisdiction gave conflicting judgments in one day. The three courts that heard the cases are the Owerri Division of the Appeal Court, the Federal High Court, Abuja, and another High Court in Owerri, the Imo State capital. At the Federal High Court, Abuja, Governor Okezie Ikpeazu had through his lead counsel, Chief Wole Olanipekun (SAN), filed an application before Justice Okon Abang praying for a stay of execution on the judgement seeking to remove him as the governor of Abia State. The second suit was the one filed by Uche Ogah at the appellate court seeking an order to compel the Chief Judge of Abia State to swear him in as the governor of the state based on the Certificate of Return presented to him by the Independent National Electoral Commission, INEC. The third suit was filed by Mr. Friday Nwosu, a Peoples Democratic Party, PDP, governorship aspirant, who is praying that he, and not Ogah, should be sworn-in as the governor of the state upon the nullification of Ikpeazu’s election. Although the case has been further extended for hearing on July 18, it is important to take a look at the judgements delivered so far and the implication it will have on the individuals involved, the state and indeed the judiciary as a whole. The judgement that culminated in the sacking of Ikpeazu was hinged on tax evasion and falsification of tax receipt tendered to the court by Dr. Samson Uche Ogah. Afterwards, Justice Okon Abang of the Abuja Federal High Court therefore ordered the INEC to immediately issue a certificate of return to Oga. Justice Abang stated that her judgement was based on the Supreme Court ruling in the case of Obi vs INEC and Amaechi vs INEC. Abang’s judgment read as follows: “That to give effect to the judgment of this court, the plaintiff, Dr Samson Ogah the candidtate of the PDP in the 2015 gubernatorial election in Abia, is the person entitled to the certificate of return in the election for the office of governor of Abia State of Nigeria in the election held in April 2015. “It is hereby ordered that INEC, the third defendant should immediately issue certificate of return to the plaintiff, Dr Samson Ogah, as governor of Abia State in the election held in 2015 and restore to him all the entitlements as the elected governor of Abia. 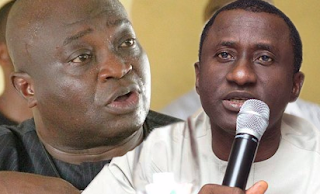 “Dr Okezie Ikpeazu is hereby ordered to vacate office as governor of Abia immediately relying on the decision of the Supreme Court in INEC vs Obi.” On June 30, 2016, shortly after INEC issued Ogah his Certificate of Return in Abuja, an Abia State High Court in Osisioma stopped the chief judge of the state or any other judge in the state from inaugurating Ogah as directed by Justice Abang on Monday. The presiding judge in the court, Justice C. H. Ahuchaogu equally made a belated order stopping INEC from issuing a Certificate of Return to Ogah as the winner of the 2015 governorship election in the state. In a suit, HOS 52/2016, by Ikpeazu, Justice Ahuchaogu ordered that “the third defendant (state CJ) or any other judge of the court or any judicial officer are hereby restrained from swearing-in the first defendant (Ogah) while the claimant remains in office in accordance with Section 143(1) and (2) of the Electoral Act 2010. Now, this created further confusion as to who the authentic governor of the state is. In another development, Friday Nwosu, a PDP governorship aspirant, also went to an Owerri Federal High Court in Imo State urging the court to declare him as the “lawful” governor of the Abia State and not Oga based on the tax ruling by Justice Abang ordering Ikpeazu to vacate office as governor. The court, presided over by Justice A.I Allagoa, however, refused to grant Nwosu’s prayers by dismissing his suit on the basis that Nwosu could not prove that the tax documents were forged. The judgement stated further that Ikpeazu could not have issued himself the said receipt which was alleged to be fraught with irregularities, noting that it was purely an internal matter for the party to handle and it did the best way it could by going ahead with Ikpeazu’s candidacy. Now, the BIG question: What has really changed? Considering that two different candidates within the same party submitted similar petitions to two different courts with varying judgments shows the inconsistency of the Nigerian judiciary in adjudicating dispute and conflict resolution. What makes one ruling more compelling than the other? As it stands, the law courts’ judgements are bound and backed by time. The latest ruling by Justice Alagoa overrides the earlier judgement by Justice Abang. In addition, Justice Abang has handed off the (Ikpeazu Vs Ogah) case and has referred both parties to the appellate court since an appeal has been entered on the matter.